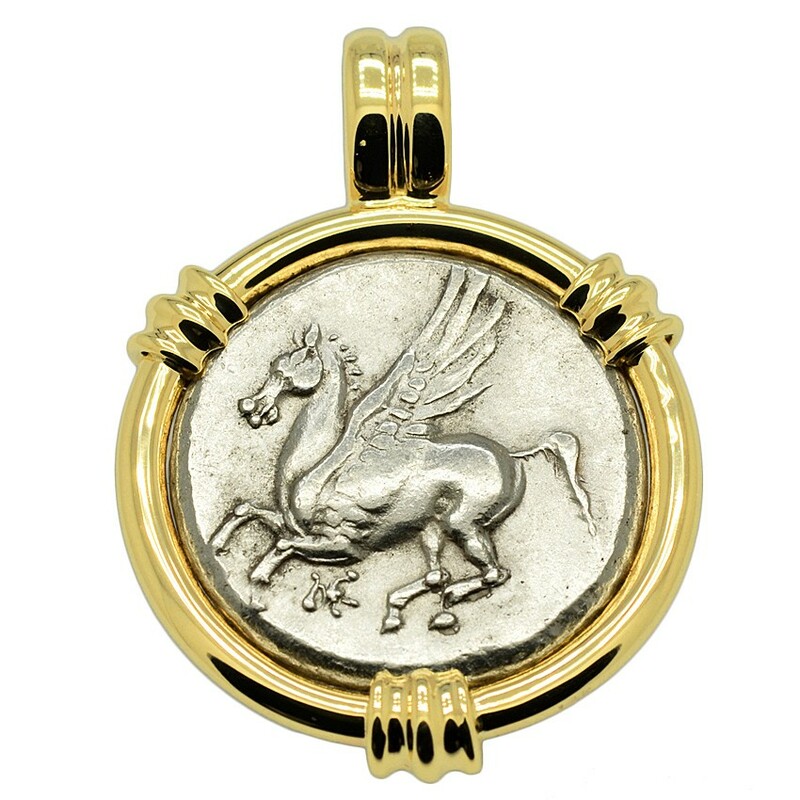 SOLD Pegasus and Athena Stater Pendant; Please Explore Our Greek Pendants For Similar Items. This ancient coin was minted in the city of Mesma, which was located along the west coast of the Bruttium peninsula, in present day southern Italy. Greek settlers from Corinth and other cities began arriving here in the 8th century BC, bringing with them their Hellenic civilization, which would leave a lasting imprint on the culture of ancient Rome. This 4th century BC coin minted in Mesma, features Pegasus, the Greek mythological flying horse. Pegasus first set foot on Earth at Corinth. 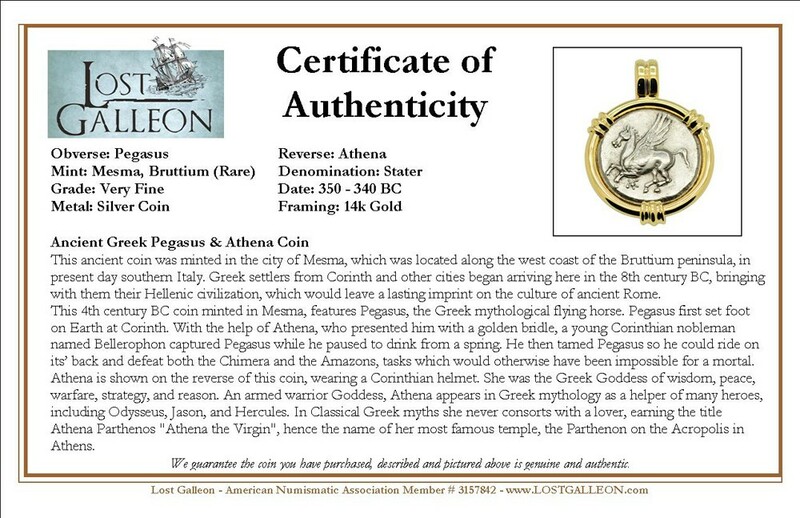 With the help of Athena, who presented him with a golden bridle, a young Corinthian nobleman named Bellerophon captured Pegasus while he paused to drink from a spring. He then tamed Pegasus so he could ride on its’ back and defeat both the Chimera and the Amazons, tasks which would otherwise have been impossible for a mortal. 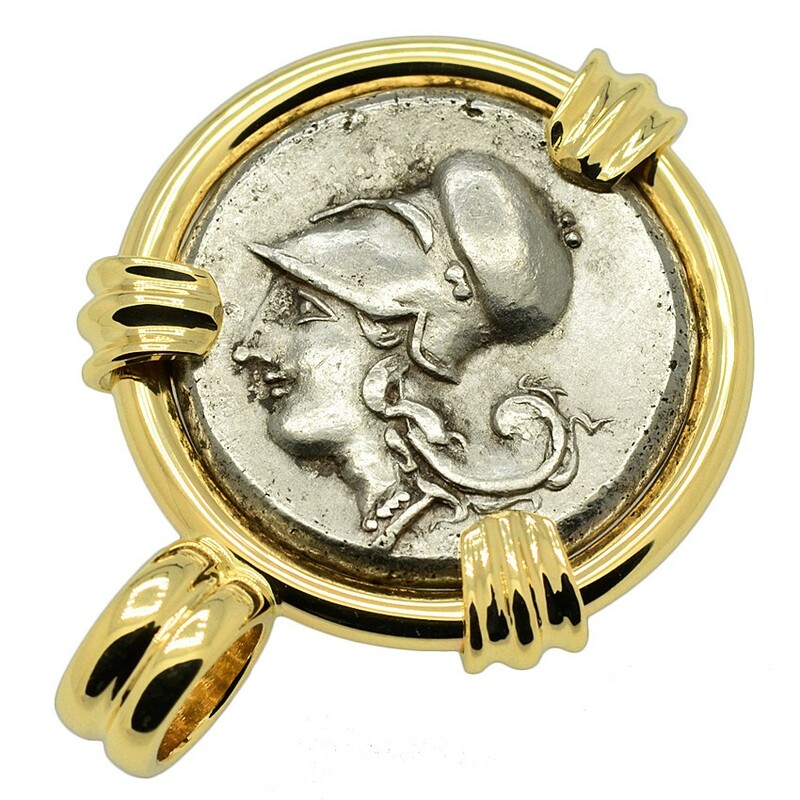 Athena is shown on the reverse of this coin, wearing a Corinthian helmet. She was the Greek Goddess of wisdom, peace, warfare, strategy, and reason. An armed warrior Goddess, Athena appears in Greek mythology as a helper of many heroes, including Odysseus, Jason, and Hercules. In Classical Greek myths she never consorts with a lover, earning the title Athena Parthenos "Athena the Virgin", hence the name of her most famous temple, the Parthenon on the Acropolis in Athens.